Meet our buddy Rex! 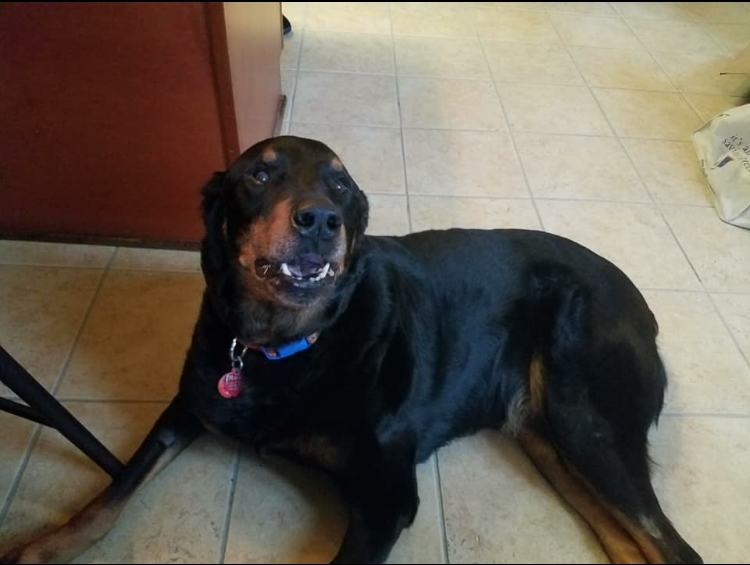 Rex is an 11 year old Rottweiler. In August of 2017 he was diagnosed with lymphoma. Depending on the type and grade, lymphoma is often one of the most treatable forms of cancer in dogs (without treatment most dogs with lymphoma will succumb to the disease in about 2 months, with treatment they can live one to two years or more), Rex had one of the more treatable types, so Rex’s owners immediately had us start chemotherapy and supportive care. Rex’s lymphoma went into remission and stayed in remission for over a year! In October of 2018 Rex’s lymphoma came out of remission and we began a second chemotherapy treatment protocol, his lymph nodes shrank significantly after his very first treatment in round 2, which is a very positive sign that the chemotherapy will be successful at achieving remission again. Rex is currently on week 15 of a 25 week protocol and is doing fantastically well! He’s feeling good, eating well, and is sassy! Most pets handle chemotherapy very well. The vast majority of dogs experience minimal to no discomfort due to chemotherapy, usually a day or two of nausea and diarrhea is all that’s to be expected (if there are any side effects at all), and those are generally easily controlled with the many medications available to us. The goal of lymphoma chemotherapy is to put the disease into remission for as long as possible. With chemotherapy most dogs don’t lose a significant amount of hair and it does grow back if they do lose some (they don’t go bald!). Choosing whether or not to treat lymphoma is a personal decision, based on the type and grade of lymphoma, the pet itself (some treatments require a day’s hospitalization for intravenous administration, regular blood draws are a necessity, a pet who cannot accept handling might not be a good candidate unless light sedation is an option, which adds to the expense), and of course finances. Many insurance plans cover at least some chemotherapy, but not if the lymphoma is a pre-existing condition. Chemotherapy for lymphoma is not inexpensive, but if it’s the right choice for your pet, it can be very effective. With treatment, there is a 60-75% chance of achieving remission. Rex has already exceeded the average lifespan for his breed and is doing great! He’s our very special friend and we thank Rex and his family for allowing us to share his story with you.